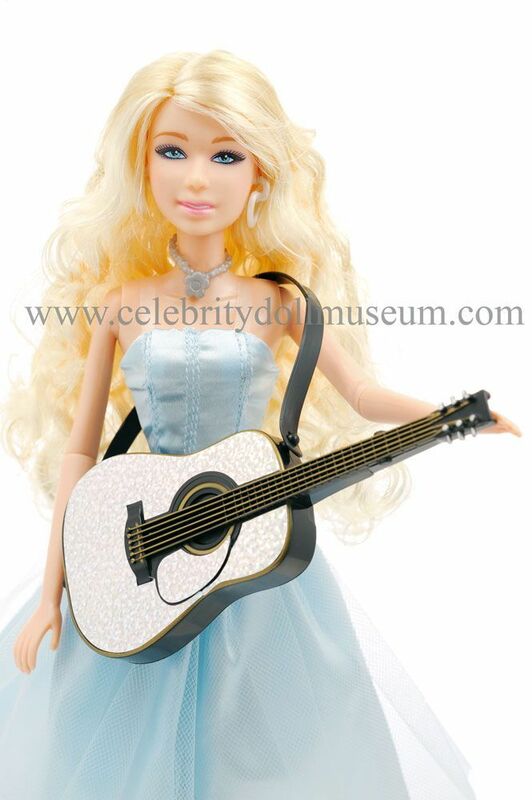 The Taylor Swift celebrity doll portrays her as herself, a country pop singer-songwriter and actress. 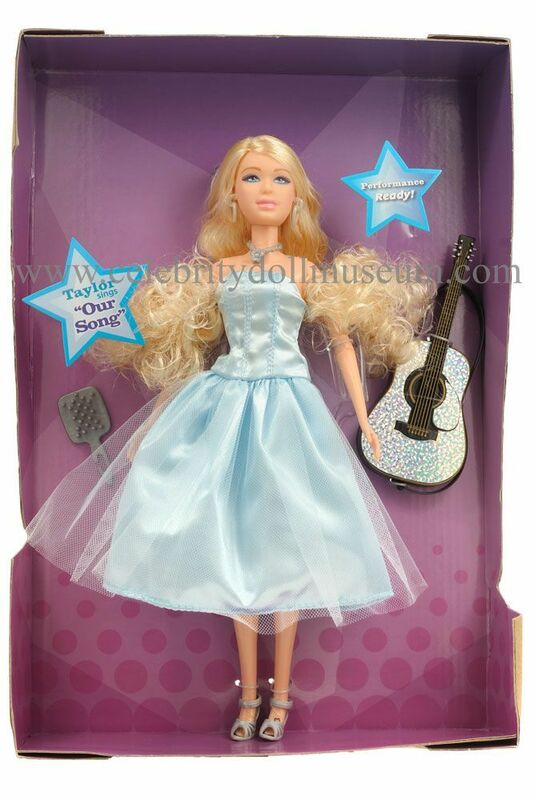 The doll was made in 2009 by Jakks Pacific under licensed from Taylor Swift Productions, Inc.. 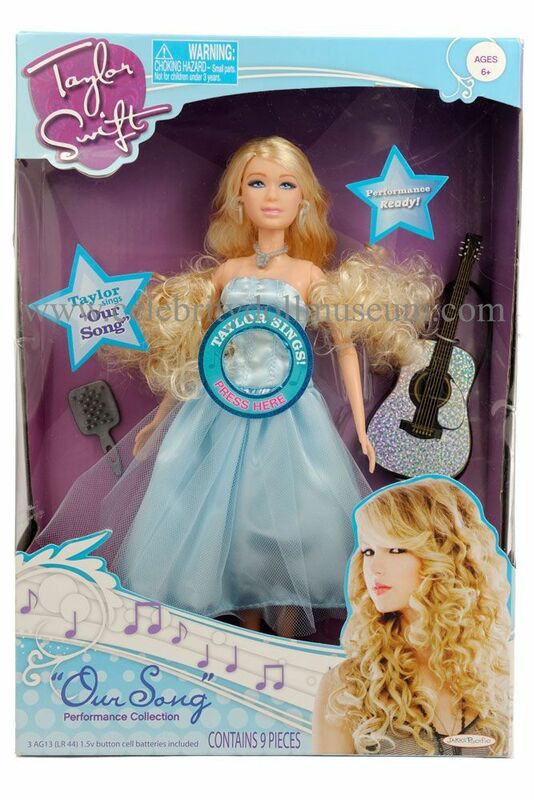 The doll is part of the Sing Along with Taylor Swift Performance Edition and plays the chorus of the song “Our Song” when you push a button on her stomach. 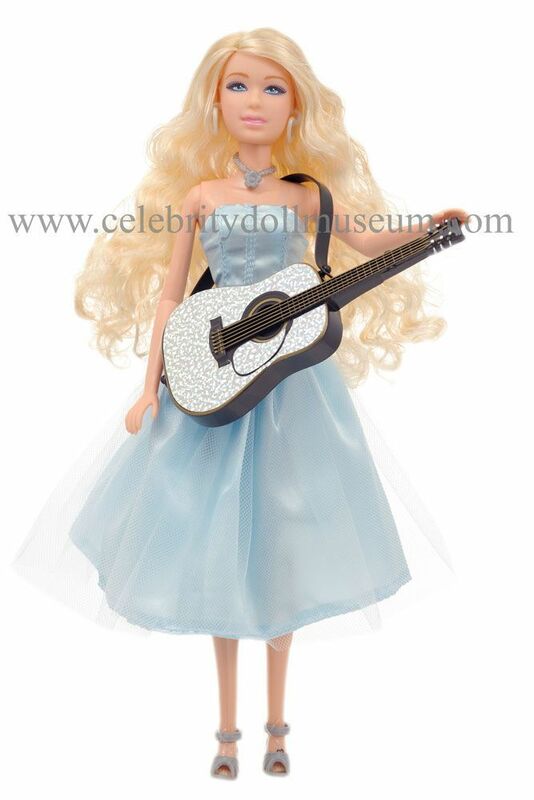 Jakks currently makes four Taylor Swift singing dolls in the Performance Edition and another four non-singing in the Fashion Edition. Taylor Swift’s official website is www.TaylorSwift.com. 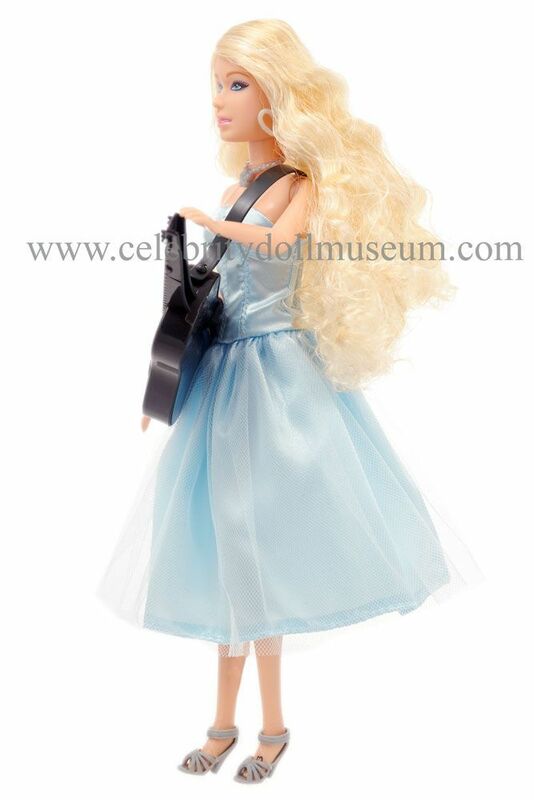 The doll comes wearing a light blue reproduction sleeveless gown that Swift wears sitting on the front porch in the video “Our Song”. 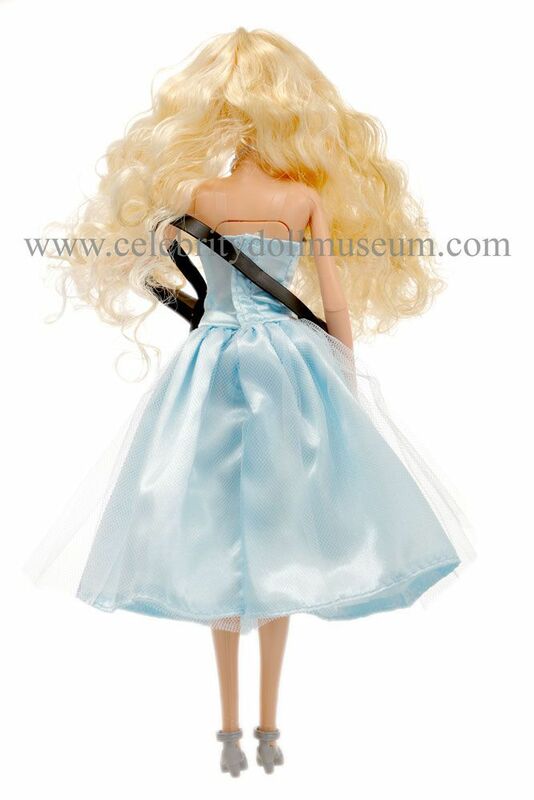 It has blue plastic earrings, a necklace, and gray-silver high heel shoes. Accessories include a silver glitter stickered acoustic guitar with strap and a brush. Underneath her dress the doll is wrapped in paper as a slip to hold her legs together. In addition to the painted lipstick and eyes, the doll has white painted on underwear and a heart shaped tattoo on the left ankle. Jakks gave her a molded innie belly button as well as a outtie button at her waist to play the song. 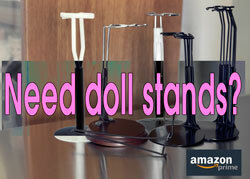 There is no doll stand. The dolls knees bend and the legs can move apart so it does the splits. The arms don’t bend but elbows are jointed to twist so the hand can flip over. The neck moves up and down only a few degrees and goes side to side. The shoulders and hips are jointed to move in any direction. 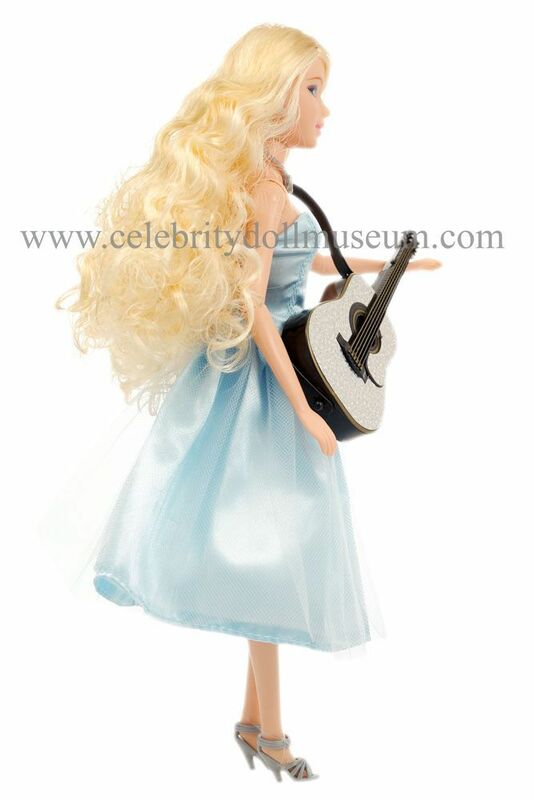 Since the doll was made for play, it is unfortunate that the arms can’t be posed to hold the guitar properly, but at least it has a strap. The doll uses three L44 button batteries in a compartment on her back. There is a switch to change from the demo that repeats two stanzas to full play which plays a 20 second version of the chorus from “Our Song”. You do have to wrestle it from the packaging and undo the back of the dress to get at the switch.